Okay, okay, I won’t do another one on a common fruit this month- I thought I might try instead, an uncommon vegetable- Goldenrod. Goldenrod? Seriously? I see you looking at the screen in bafflement…Goldenrod or Solidago has been saddled with a bad name, and one I think it doesn’t really deserve as it is an extremely useful plant in the ornamental and veggie garden, and it’s pretty smack-you-in-the-eye gorgeous when in full bloom. I both love and rue the Goldenrod in my garden- there’s a big patch of it that had become entangled with an azalea sometime before I took possession of the yard. I’d sure like to see what colour that azalea is- but the goldenrod hogs all the nutrients and it has never bloomed. Every year, I swear I’m going to dig out the entire plot, remove all the underground stems of solidago and let the azalea be what it should. And yet- when it blooms, glorious and gold in late summer, six feet high, it’s just so damn regal I just can’t bring myself to root it out. Goldenrod is native to North America, with a sprinkling of species in Eurasia and South America, and one cannot peruse any text on ethnobotany without coming across the traditional uses of goldenrod in herbal treatments for colds, liver and kidney troubles, fever, skin ailments, nausea and as a general tonic tea. It was also included in some smoking mixtures or used as a smudge. To the Omaha tribe, it was an indicator plant that bloomed when the corn was ripening and harvest nearing. There haven’t been a lot of good studies on solidago, but it’s almost universally used by native Americans and Europeans alike for very similar reasons- I think there has to be some properties that haven’t been fully explored yet. The few studies that have been done reveal it to be anti-inflammatory, relieve muscle spasms, fight infections, and lower blood pressure. It does seem to have diuretic properties, and is used in Europe to treat urinary tract inflammation and to prevent or treat kidney stones. In fact, goldenrod is commonly found in teas to help “flush out” kidney stones and stop inflammatory diseases of the urinary tract. But herbal uses are just the beginning! AND- yes, there’s more to this multifunctional plant- it makes an unbeatable companion plant for the gardener- attracting massive amounts of predatory insects, butterflies and bees. This plant produces a LOT of nectar and may just be the most popular plant in the garden in August, buzzing with activity. It’s a must for butterfly gardens, many species find it highly attractive. Now- this is a bit icky, but if you’re an organic gardener you’ll appreciate it- this plant attracts hordes of aphids that are plant-specific, meaning they won’t touch the plants next to it. Mine’s always coated in grey aphids come late spring, but then the ladybugs arrive and begin to breed- there could not be a better nursery for ladybugs and other predatory insects. Simply put, if you want predators, you need prey- and you’ll have that in spades. And the goldenrod doesn’t even seem to CARE that it’s coated in bugs-it does just fine despite the annual infestation. 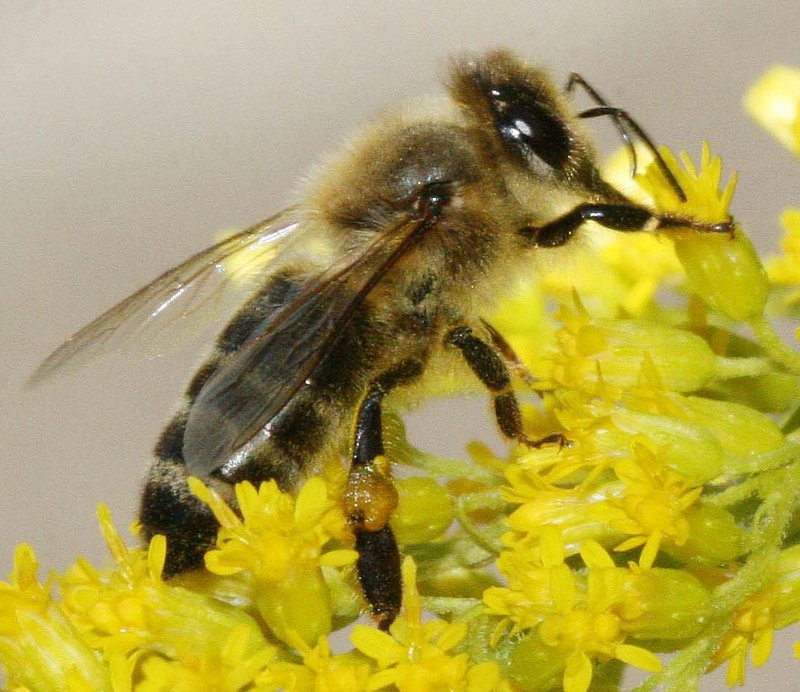 If all this wasn’t enough to encourage you to plant a little patch of goldenrod, the thing that makes it a pest also makes it a boon to amateur gardeners and people faced with a harsh spot where little else will thrive- Goldenrod will grow almost anywhere. It prefers full sun but will make do with light shade, enjoys poor, rocky soils that horrify delicate perennials but will also grow in good garden soil (a cautionary note- it may go INSANE in good garden soil so don’t plant it where you’ll never be able to dig it out when it spreads. Or put it in a pot.) It is extremely hardy: Solidago canadensis is good to zone 3 and there are even hardier ones available. This is a plant that needs to be treated badly, in short. Plant it in a pocket surrounded by packed, gritty soil- do not fertilize. Cut back to the ground when the stems have died. It will be well behaved and a valued addition to the garden- but give it good, rich garden soil and lovingly ladle compost on the plant as if it needed cosseting and it may become a rapacious monster, bullying less vigorous plants into submission. 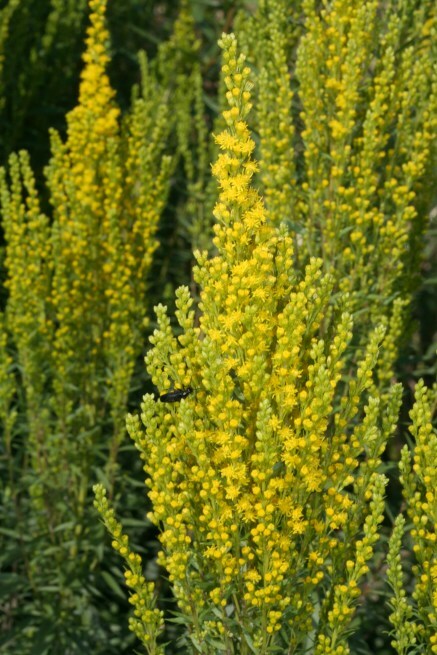 Almost needless to say, goldenrod grows easily from seed that has been stratified (chilled in an artificial winter,) and can also be cloned from divisions of the original clump. It should not be too hard to find a specimen in a nursery, but the consensus is still split between it being a weed or an ornamental plant, so it’s not carried in large numbers like fall asters, although they belong to the same family and bloom at the same time. Purple asters, by the way, look fantastic paired with goldenrod! If you’re desperate for a plant and cannot find any in your local nurseries, you can probably find some walking in open areas in late summer, early fall- they are a native plant. Of course, I would never recommend digging up plants from the wild- but they can spare a root clod or two and there’s always collecting the seed. 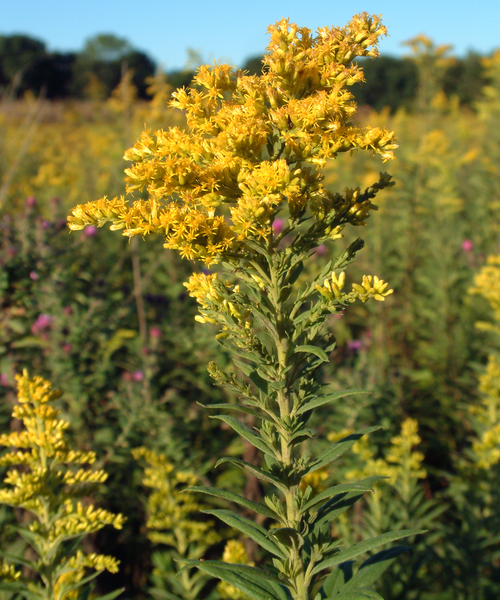 Oh, and if you haven’t already found out- Goldenrod does not cause seasonal allergies! It has a heavy, sticky pollen that is carried from flower to flower by insects, not the wind. Something else is making you sneeze.